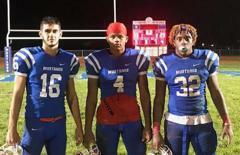 The Mustangs trailed by 11 points before 21 unanswered points over the 17 minutes handed them a huge win. RUNNEMEDE – One or two moments are all that really matter in a tight game. On Friday night, the Triton High School football team faced just that moment. The Mustangs came out strong against Ocean City and held the ball until 1:30 remained in the first quarter, with a lead and a pair of onside kicks to its credit. That said, in the third quarter Ocean City had battled its way back in a seesaw game down by three points with the ball and headed straight for the Mustangs goal line. An interception by Joe Rubba, followed by 10-play, 74-yard drive that culminated in a 34-yard strike from quarterback Geff Giancaterino to Dauvante Payton settled the night with a 33-23 win for Triton in a West Jersey Football League interdivision game. Triton (4-2) will host Seneca next week and Pennsauken the following week that could set up a National Division title. Ocean City (3-2) appeared flat off its bye week as Triton built an early 12-0 lead. In fact, the Mustangs scored on their first play from scrimmage, a 63-yard jaunt by Staton and then after an onside kick took a 12-0 lead as Staton scored his second of three touchdowns on the night. Ocean City, still undefeated in the Independence with games against Oakcrest and fellow division leader Mainland still on the docket, did respond with a pair of touchdown connections between Ian Aungst and Brandon Lashley to take a 17-12 lead at the half. The lead improved to 23-12 on the opening drive of the second half as Aungst ran in from 7 yards but Triton didn’t fold. Six plays – all runs – capped off by a 25-yard touchdown by Staton out the Mustangs back up. Both teams struggled over the next few possession until Ocean City found itself on the Triton 33-yard line down three. Aungst looked again for Lashley, who found space along the sideline inside the Triton 5-yard line. What appeared to be a great leaping catch was ruled out of bounds and the Red Raiders let that frustration disrupt their mindset. Rubba intercepted the next pass and Triton had more than just momentum, the Mustangs had the ball and one idea only, and that was to score. On fourth-and-3 – the Mustangs converted five fourth downs on the night – Payton got behind the Red Raiders defense and in effect, it was game over. “He was open,” Giancaterino said. Quarertback Geff Giancaterino, running back Eric Staton and wide receiver Davaunte Payton all scored in the second half of an impressive win.